Bring those tresses back to life! Oh, the summer that was: days of chasing the sun and splashing in the cool water, and sipping cocktails while watching the sunset. Another one of your best summers ever? Probably, except for this spoiler: your dry and damaged hair. While the sun can do major damage on your tresses, combine that with saltwater or pool water (or both! ), and you've got yourself a recipe for hair disaster. Use a moisturizing shampoo every time you wash your hair. Every time you shampoo, make sure to use products that have moisturizing and conditioning ingredients. The Limited Edition Pantene UV Rescue Shampoo has 40 percent more repairing essence than your regular non-conditioning products, making it an effective and easy way to treat your hair from within while cleaning it too. Plus, its Pro-V formula also nourishes hair from deep within, repairing the damage from root to tip. Prevent further hair damage with UV-shielding products. You don’t just need to repair your hair; you also have to prevent it from further damage. Using a product that protects your hair from UV damage like the Limited Edition Pantene UV Rescue 3 Minute Miracle Conditioner is an easy and quick way to repair and protect your tresses every day. Applying it after you shampoo can reverse three months’ hair damage in just three minutes. 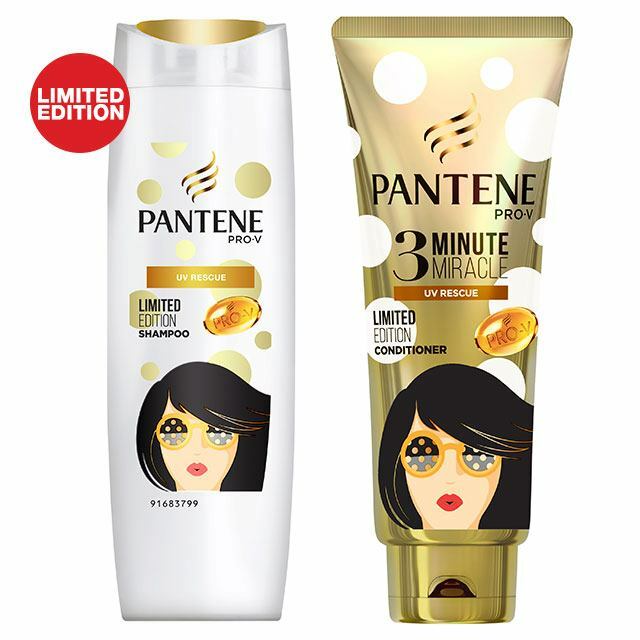 The Pantene 3 Minute Miracle Conditioner deeply moisturizes your hair without the greasy feel you hate—even under the scorching sun. Your hair really shouldn't take in more heat after all those warm days at the beach. Skip the hot rods and opt for styles that don’t require tools. Sporting braids or a headband is a smart and cute way to hide frizz and dryness without damaging your hair any further. Avoid putting harsh chemicals in your hair. Now isn’t the best time to get a perm or have your hair straightened, no matter how frustrated you may be with the frizz and the dryness. The harsh chemicals from those treatments will further damage your hair, making your locks even harder to repair and manage. Focus on getting it back to health first with conditioning treatments and some TLC. Visit Pantene Philippines on their website, or shop the UV Rescue products on Lazada. For more information, follow Pantene on Facebook.